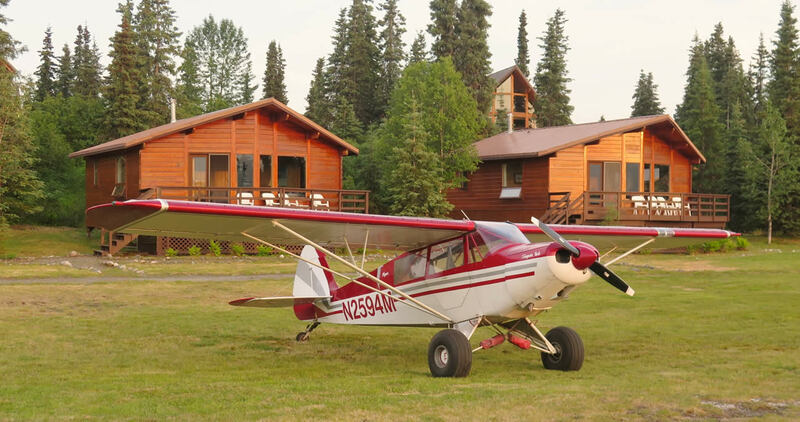 At Chelatna Lake Lodge you can expect some of the most luxurious accommodations of any remote fly-in Alaskan lodge. 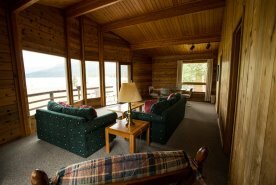 The lodging is deluxe, featuring four two-bedroom Justus Cedar chalets, an impressive main lodge and dining room, a separate lodge for recreating, and a lakeside sauna, all beautifully situated facing one of the most outstanding views that Mother Nature has provided. 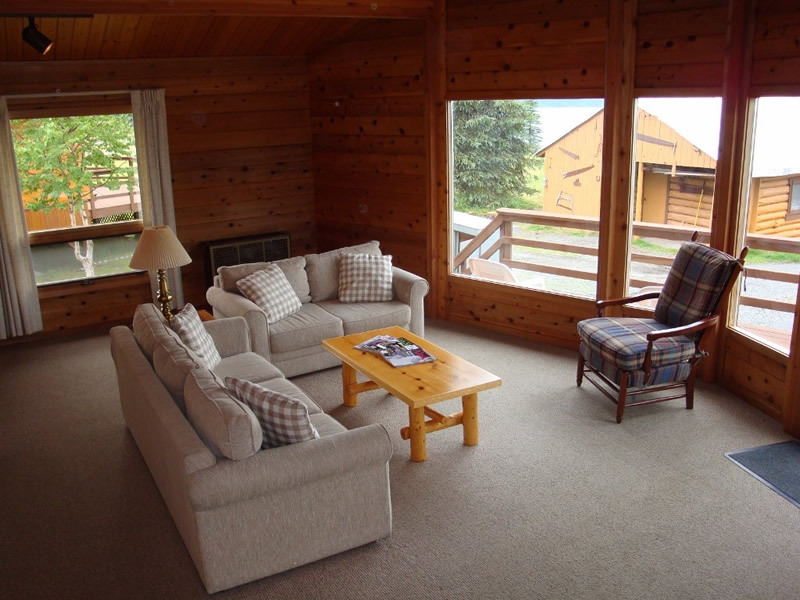 Imagine staying in a beautiful chalet with a large glassed-in prow front living room and spacious deck. 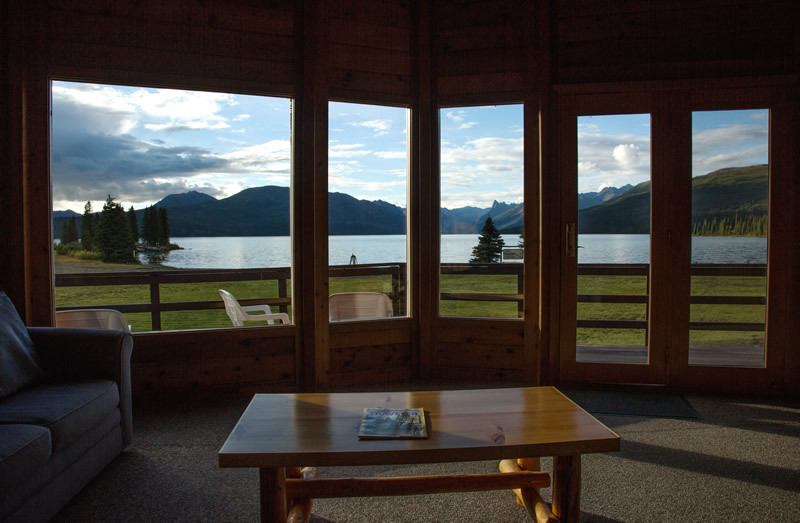 Each chalet is situated lakeside, allowing for spectacular views of the lake and surrounding mountains. 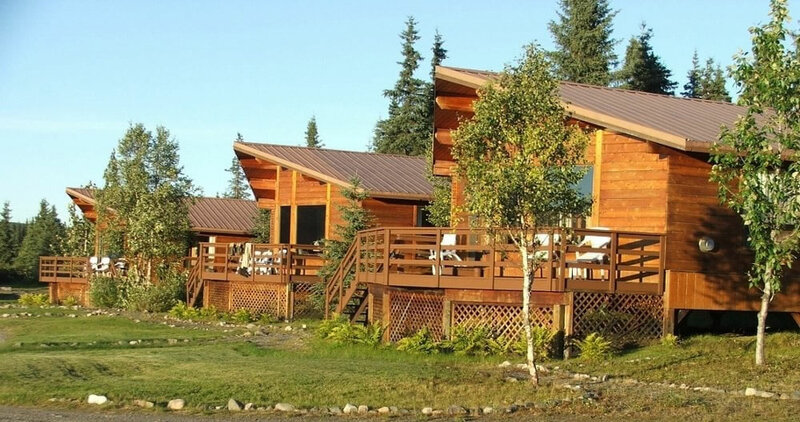 The chalets all have two bedrooms and two private bathrooms, wall-to-wall carpeting, gas heat, 24-hour electricity and all the hot water you’ll need to ensure your total comfort, just perfect for relaxing in the "Land of the Midnight Sun." 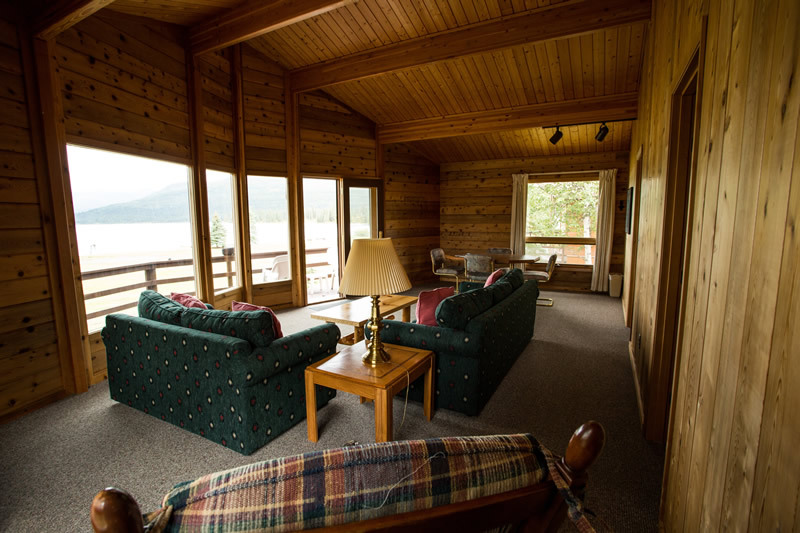 The living room of one of the chalets. The view from the living room in each chalet. The bedroom of the chalets. 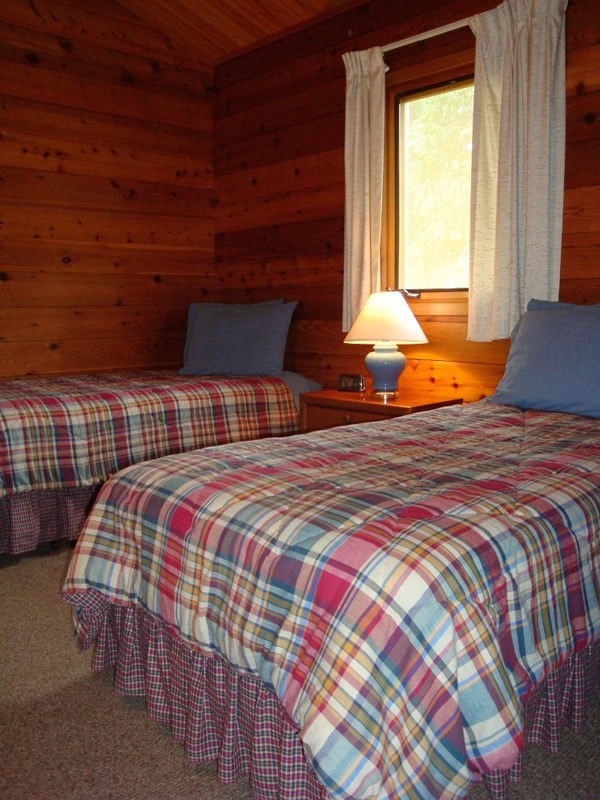 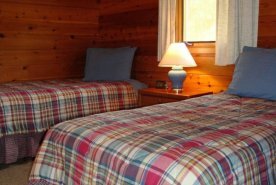 Rooms can be equipped with a queen, a twin, or two twin beds. 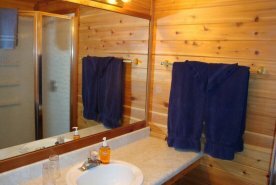 Each chalet has 2 bathrooms with running hot an cold water. 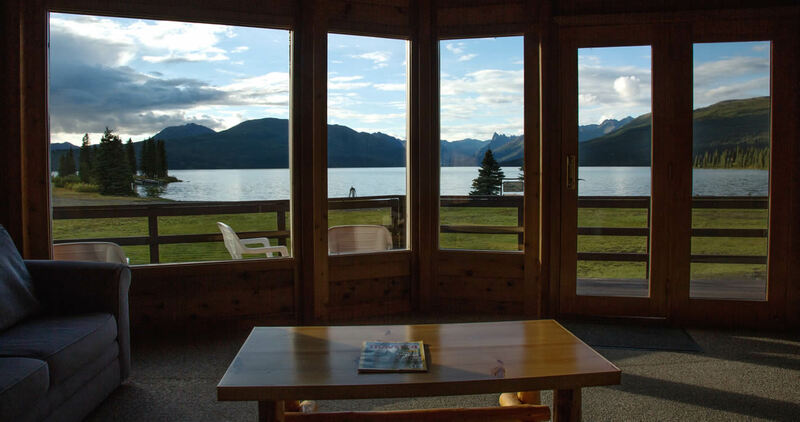 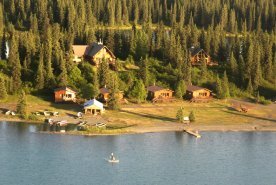 The main lodge is a majestic cedar chalet overlooking the aquamarine waters of the lake and the breathtaking Alaska Range. 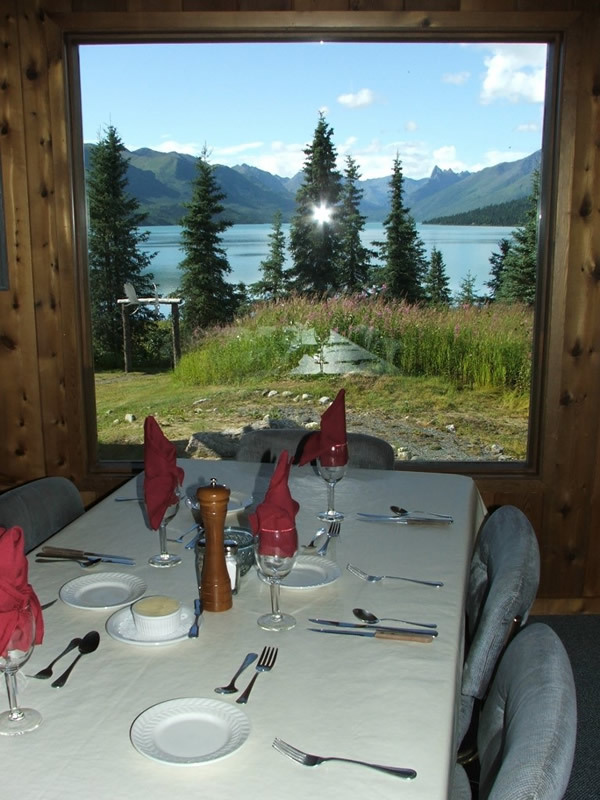 It is the perfect place for relaxing with other guests, swapping adventure stories, all the while enjoying deliciously prepared appetizers and meals from our renown chef. 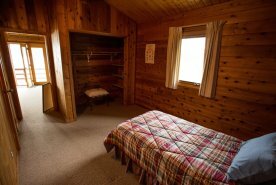 Additionally, a charming, 1940s-era Alaska hand hewn log cabin is another place for taking it easy after a hard-day's playing. 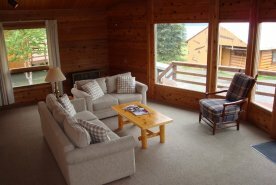 This vintage lodge is outfitted a wood stove, a fly-tying table, a television, DVD/VCR, lots of books, videos, DVDs, cozy couches and a game table. 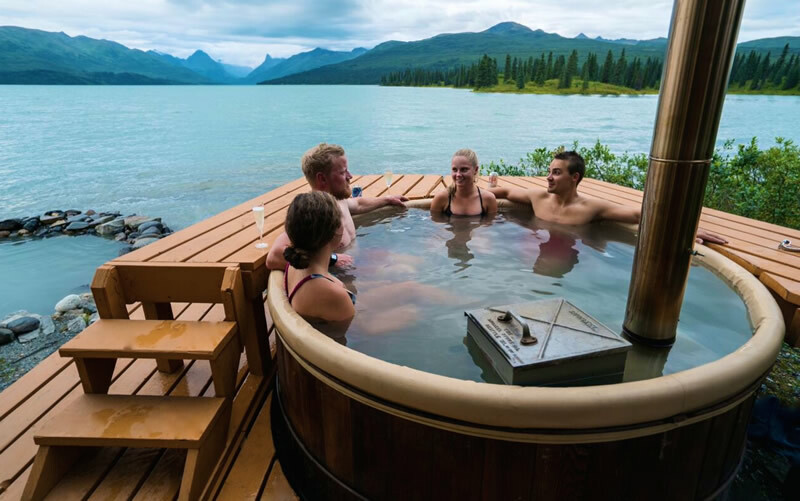 A wood-fired sauna set at the water's edge helps work out the kinks after an active day. 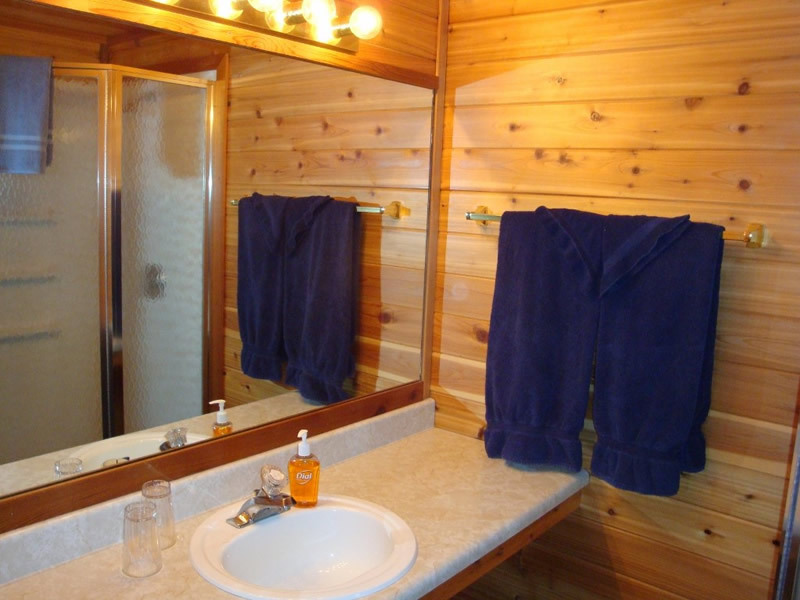 If you are feeling on the extra warm side and maybe a little bit bold, perhaps a jump in the lake too cool down. The dining experience cannot be overlooked. 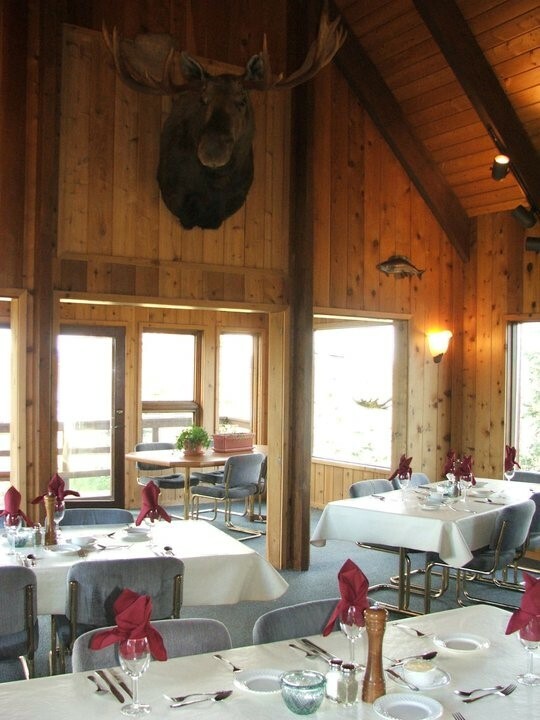 The dining room atmosphere is relaxed and sumptuous all at the same time. 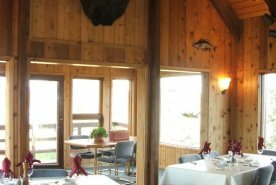 Meals are brought directly to your table by our friendly staff, as you sit and relax and enjoy panoramic views from every seat. 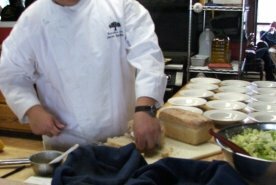 Hearty delicious meals, specially prepared by our expert chef are presented daily with home baked breads and desserts and the freshest of ingredients. 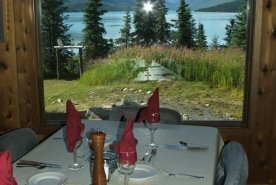 We are happy to accommodate diet restrictions. 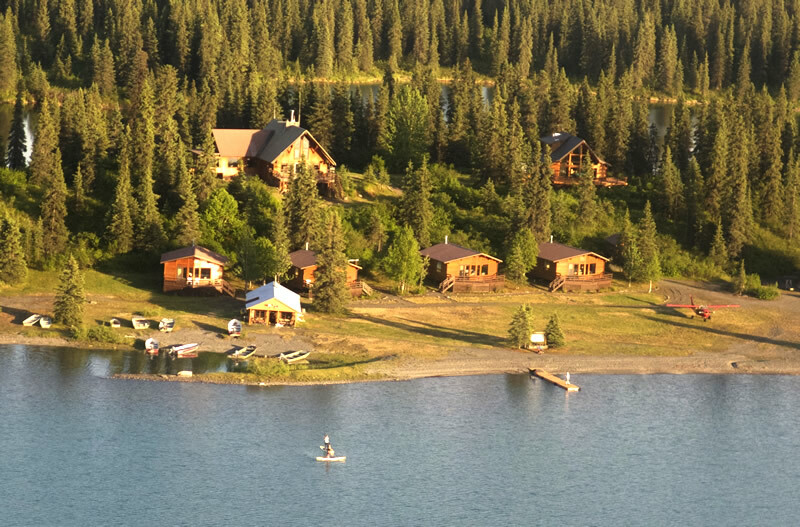 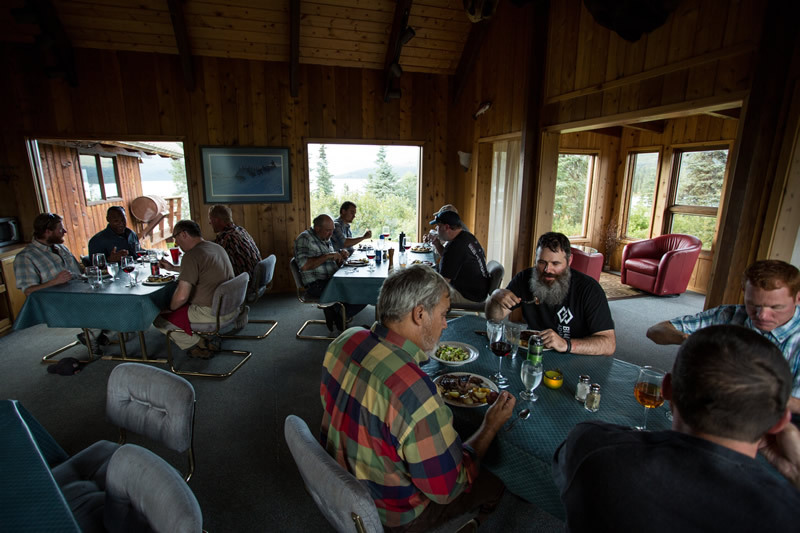 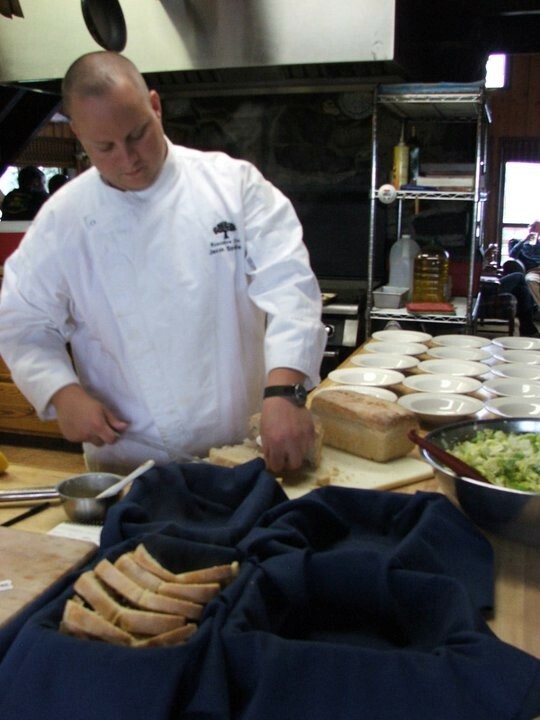 Warm Alaskan hospitality and unparalleled service round out your experience at Chelatna Lake Lodge to ensure that your visit to Alaska will be absolutely unforgettable.